Today Constable may seem an unlikely revolutionary. Mild, even staid, in comparison to his contemporary and rival JMW Turner, his lush green landscapes show nothing of the unrest in rural communities, but seem to amble along in their slow-paced dream. But his paintings form a bridge between the traditional landscapes of Rubens, Poussin, leading to Gainsborough, and the new approaches of the Barbizon School, Corot, and Impressionism. For all the popularity of The Hay Wain (1821), Constable was the brink of change. John Constable (1776-1837) was born and brought up in the deeply rural hamlet of East Bergholt, on the southern edge of Suffolk. Although expected to take over the family’s diverse businesses operating grain mills, a corn merchants, and small shipping, he started sketching and painting during his youth. At the age of 21, he managed to convince his father to allow him to pursue a career as a painter, and entered the prestigious Royal Academy Schools in London. There, and through his long friendship with the collector George Beaumont, he was attracted to the landscapes of Claude Lorrain, Rubens, van Ruisdael, and Gainsborough. He exhibited at the Royal Academy by 1803, and toured the British coast and Lake District, sketching and painting avidly. Determined to be a landscape painter in an era when landscapes had to be dramatic, romantic, and all ‘Salvatore Rosa’, he paid the bills from commissioned portraiture work. He established a routine of portrait-painting in London during the winter, and landscapes back in Suffolk in the summer. He married his childhood friend, Maria Bicknell, in 1816, commemorating their honeymoon on the south coast with innovative plein air paintings. From 1818 he started a series of major works, his ‘six-footers’, resulting in considerable success in Paris. Although The Hay Wain was shown at the Royal Academy in 1821, it was acclaimed by Géricault, and won a gold medal in the Paris Salon of 1824, being praised by Delacroix. The Opening of Waterloo Bridge seen from Whitehall Stairs, June 18th 1817 (1832). After his wife’s death from tuberculosis in 1828, Constable remained in depression and grief, his painting suffering too. He was finally elected to the Royal Academy the following year, and started to lecture about landscape painting, including a series of recorded lectures at the Royal Institution, before he died in 1837. Landscape painters before Constable had compiled plein air sketches, and worked them up into studies for ‘finished’ studio works. Constable was not novel in using that approach, nor in ‘skying’, painting quick sketches of the sky. Neither was he – as has sometimes been claimed – the first to sketch outdoors using oil paints. What distinguishes Constable’s preparatory work is that he was more systematic than his predecessors appear to have been, that many of his sketches and studies have survived in good condition, and the exceptionally loose and painterly style of many of them. Last year’s exhibition at the V&A London was able to show series of sketches and studies for several of his major works: in the case of his ‘six footers’ and others, these culminated in a full-scale sketch which to modern eyes is superior in many respects to the finished work. Many who have seen the final full-size sketch of Hadleigh Castle (1829) have mistaken it for the finished work. John Constable (1776–1837), Trees and Deer (1825), pen and brown ink with brown and gray wash on medium, rough, cream laid paper, 28.9 x 20 cm, Yale Center for British Art, New Haven, CT. Wikimedia Commons. Constable was trained and skilled in the use of traditional sketching media, such as a pen, brown ink, and wash, which were the mainstay of Poussin. These enabled him to construct the anatomy of each tree carefully, to indicate the main areas of foliage, and to superimpose marks for textural detail. 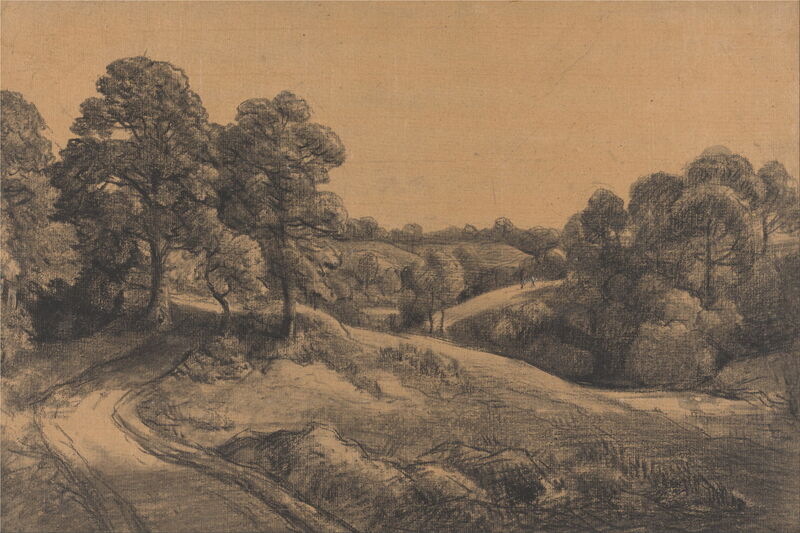 John Constable (1776–1837), Wooded Slope with a Receding Road (c 1850), black chalk and white chalk with stumping on Medium, rough, beige laid paper, 34.6 x 51.1 cm, Yale Center for British Art, New Haven, CT. Wikimedia Commons. He used graphite and black chalk (a black, chalk-like mineral) for other studies, particularly those which were more compositional in aim. Here the trees are indicated more notionally, and without attention to their anatomy. 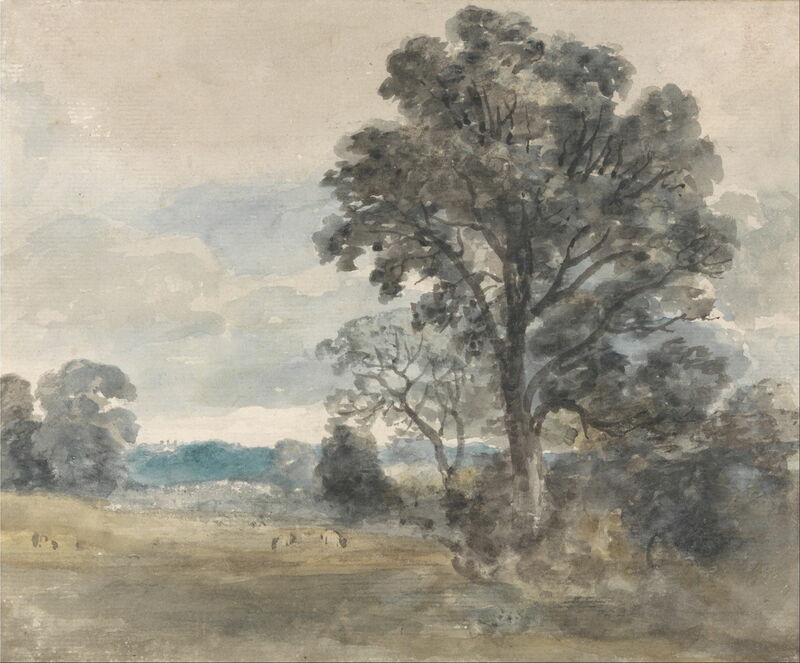 John Constable (1776–1837), Trees in a Meadow (c 1805), graphite, watercolor, black chalk on medium, slightly textured, cream wove paper, 29.5 x 25.1 cm, Yale Center for British Art, New Haven, CT. Wikimedia Commons. 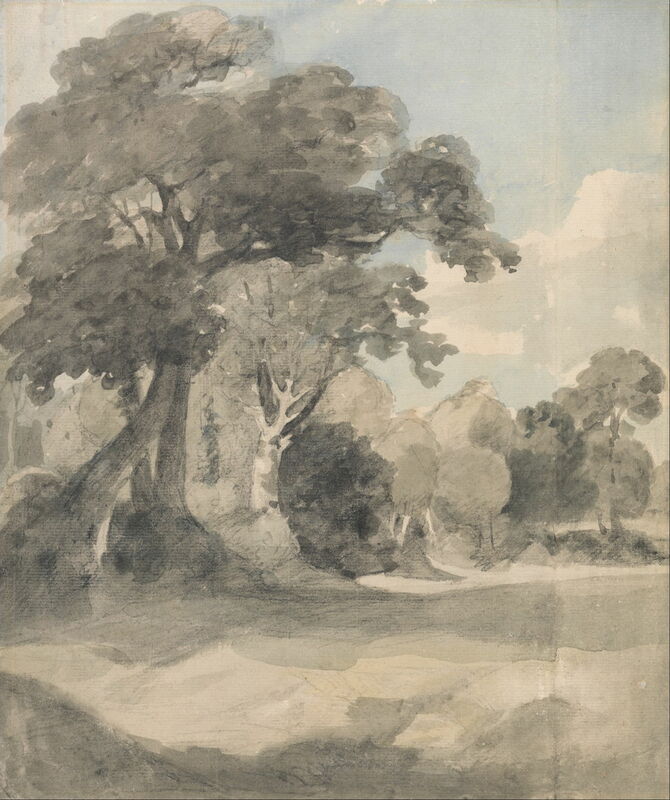 He was also adept at more modern sketches using graphite and watercolour wash, here recording structural detail in the closest cluster of trees, but indicating more distant trees in general outline form. His earlier watercolour sketches were often very precise in their depiction of tree anatomy, enabling meticulous detail when used for a finished work. Some of his watercolours were brought to more finished form. 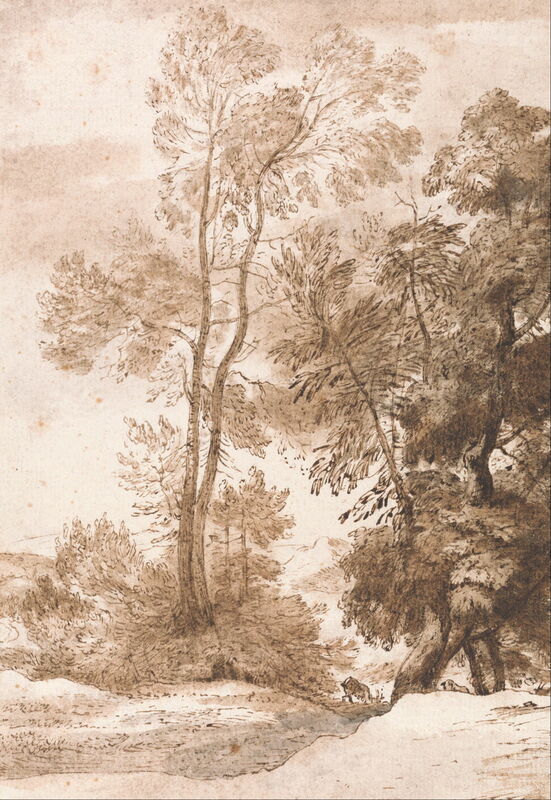 This quite rapid sketch captures the unique character of the ancient pollard (probably a willow) in the foreground, with its gnarled and conjoined trunk, remaining stumps, and the vigorous regrowth above. John Constable (1776–1837), Study of an Ash Tree (1801-3 or 1810-30), oil on canvas laid to artist’s board, 39.4 x 29.8 cm, Yale Center for British Art, New Haven, CT. Wikimedia Commons. 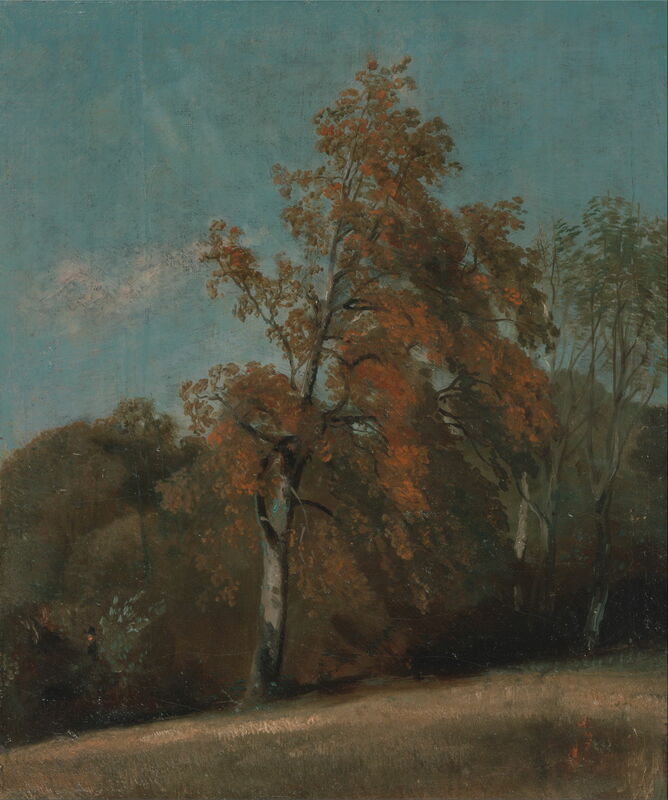 Early in his career, he learned to create plein air sketches in oils, which he used extensively for ‘skying’ particularly around Hampstead Heath near London, and for remarkable studies of trees, such as this ash, seen in its autumn colours. Despite the challenges posed by his medium, he has taken the time to construct the tree anatomically, and to detail its foliage. Working this time on paper, which was later laid on a canvas support, the trees in this plein air sketch are much rougher, with his marks more gestural. 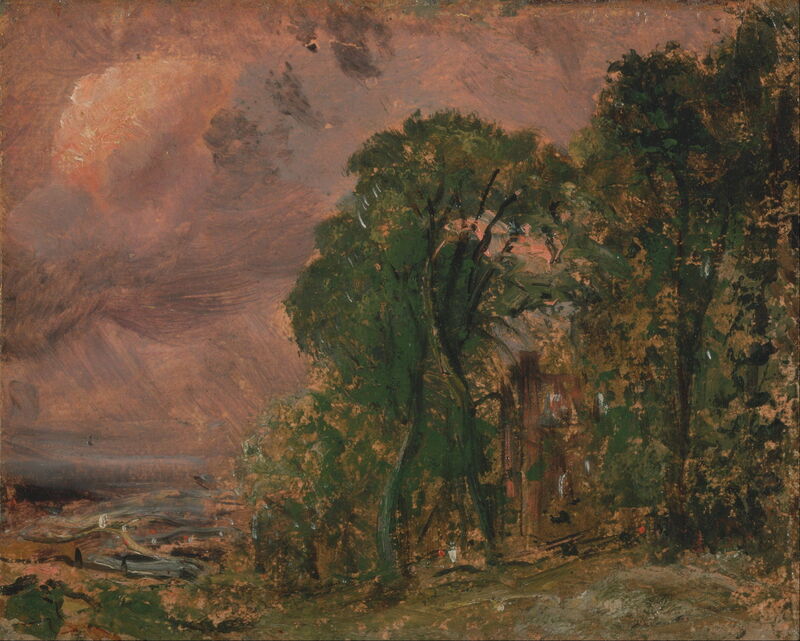 This oil sketch, in which the trees are indicated using hurried marks, appears to have been a combination of ‘skying’ the coming storm, and capturing the edge of woodland with a building beyond. 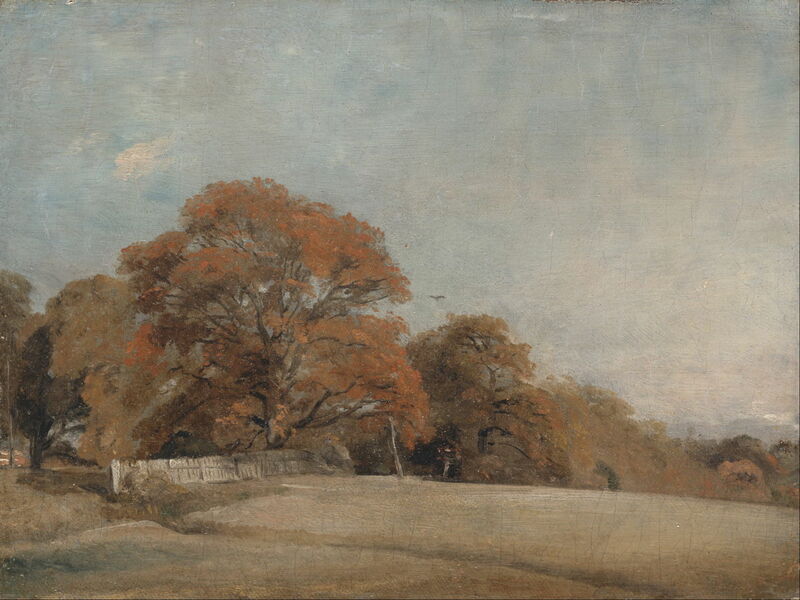 John Constable (1776–1837), An Autumnal Landscape at East Bergholt (1805-8), oil on canvas, 21.3 x 28.6 cm, Yale Center for British Art, New Haven, CT. Wikimedia Commons. As with his watercolours, some of these oil sketches were developed more slowly and carefully into paintings that may have been intended for others to see. The nearest tree has been built in detail, with highlights shown on the trunk and branches. In this case his use of canvas rather than paper suggests that the painting was not as ephemeral as his studies. 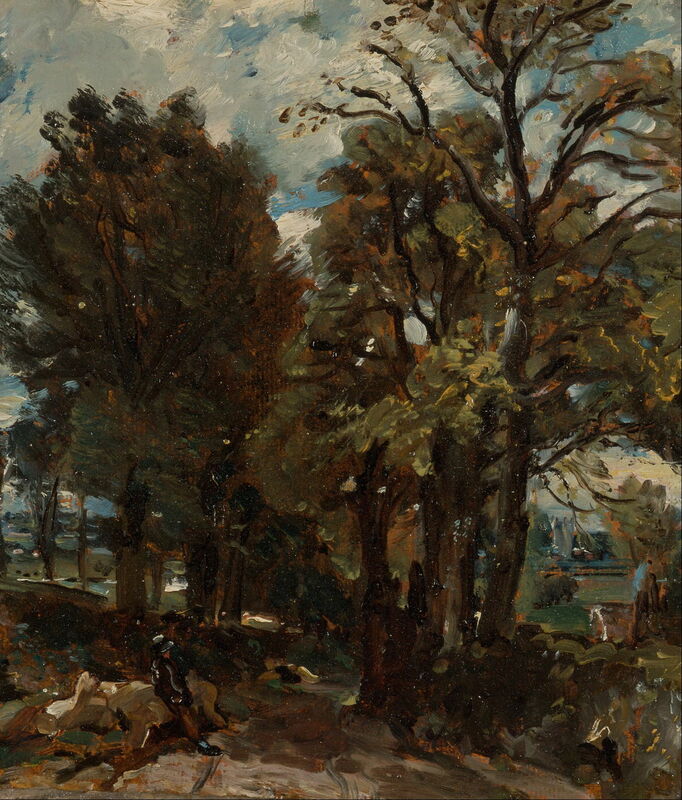 John Constable (1776–1837), Study of the Trunk of an Elm Tree (c 1821), oil on canvas, 30.6 x 24.8 cm, V&A, London. Wikimedia Commons. 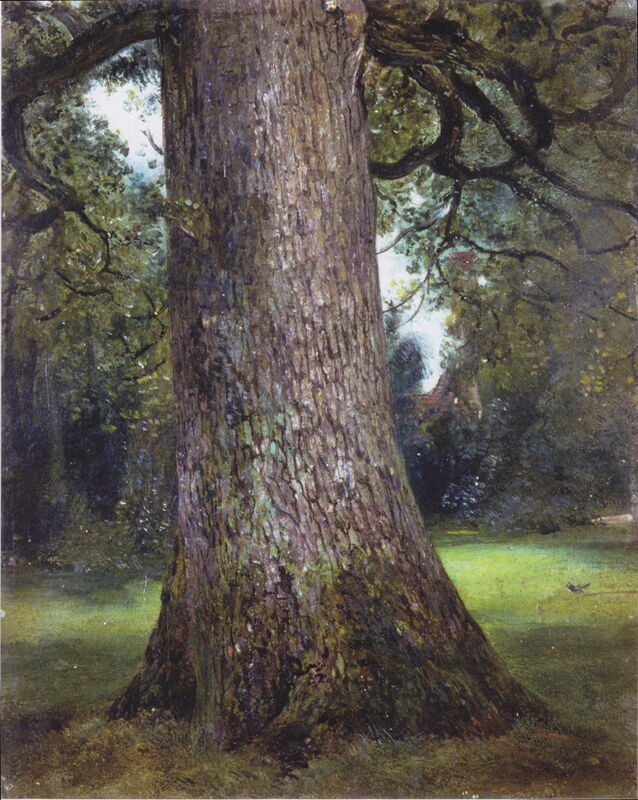 This very detailed study of an elm trunk could not have been completed in a single plein air session, and was probably undertaken in part as a standard exercise: painting the trunk of a tree was a set piece expected of landscape painters, and remained popular among the Barbizon School too. Although trees feature richly in many of his finished paintings, including most of the ‘six-footers’ (Hadleigh Castle (1829) is a notable exception), I offer two of his major works for their depiction of trees. John Constable (1776–1837), The Cornfield (1826), oil on canvas, 143 x 122 cm, The National Gallery, London. Wikimedia Commons. This exception to Constable’s steady stream of ‘six-footers’ is a more fully developed view down Fen Lane in East Bergholt, the subject of a sketch shown above. As was his common practice, he made various adjustments to the ‘natural’ view, inserting a church in the distance, for example. His depiction of trees is more in keeping with his earlier approach, in finished paintings, in constraining them to their natural appearances, rather than making them over-romantic. Coupled with the lack of any obvious narrative, the painting flopped: it was shown at the Royal Academy in 1826, even the Paris Salon of 1827-8, but remained unsold at the time of his death. It had though become sufficiently popular that it was purchased by public subscription, and has been in London’s National Gallery ever since. In The Vale of Dedham, or Dedham Vale, (1828) Constable reworked a painting of his from 1802, heightening its drama, and losing some of the naturalness of the trees. 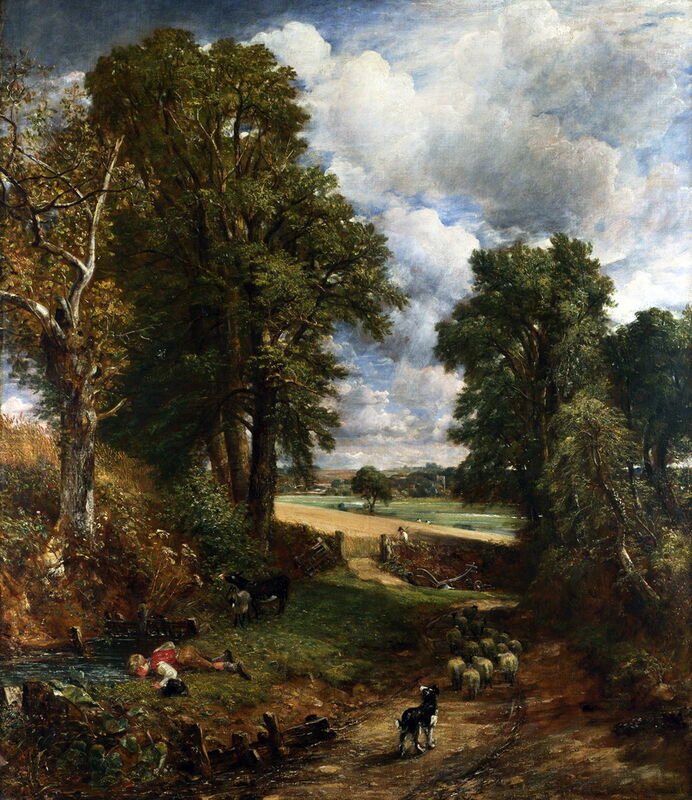 It has been suggested that this reflected the increasing disquiet in the countryside, but the twisted limbs of the high stand of trees on the right may simply have had a more ‘romantic’ touch added, something Constable tended to do increasingly after about 1825. 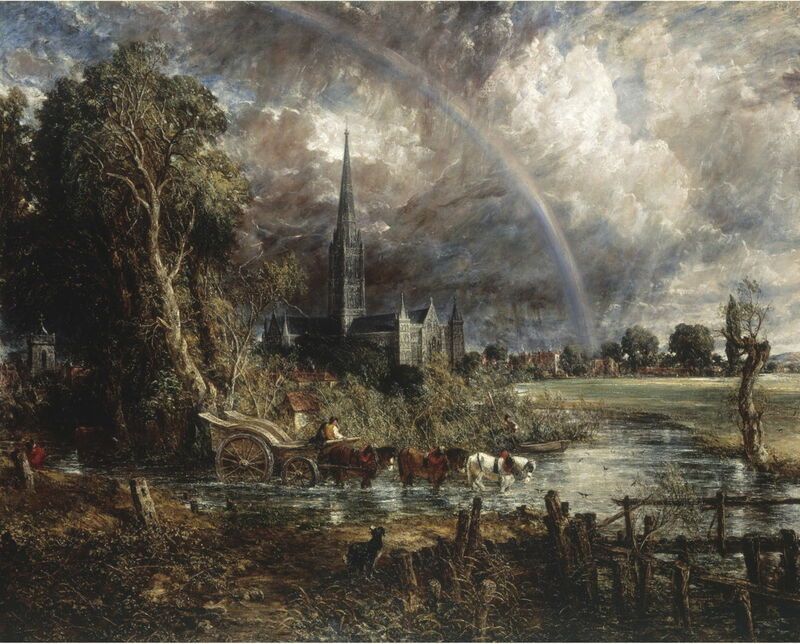 Constable first visited Salisbury in 1811, and for the next 18 years frequently visited his friends Bishop John Fisher and his nephew Archdeacon John Fisher there. 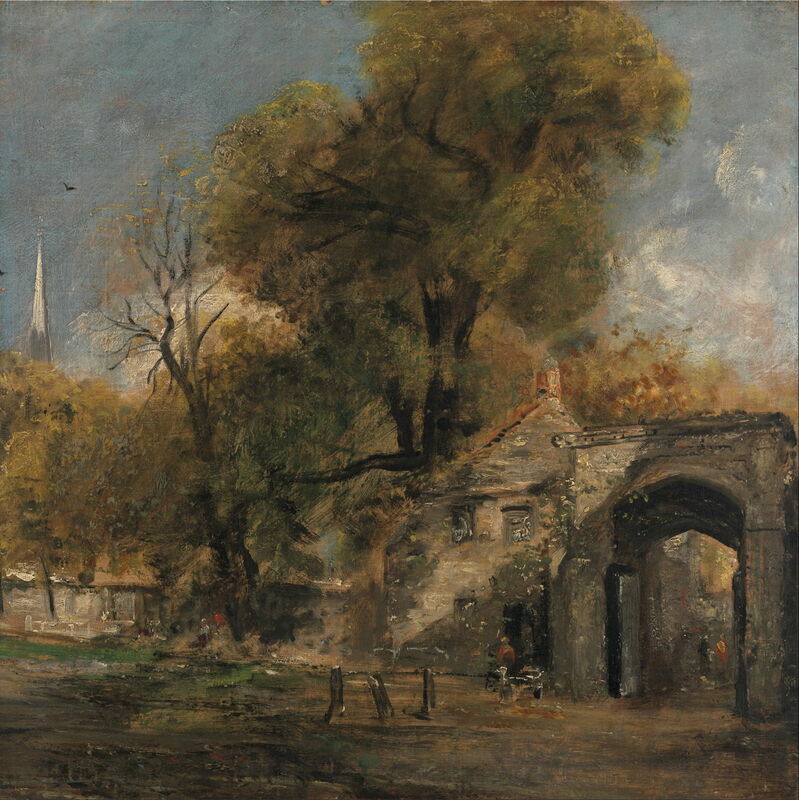 John Constable (1776–1837), Harnham Gate, Salisbury (1820-1), oil on canvas, 50.8 x 50.8 cm, Yale Center for British Art, New Haven, CT. Wikimedia Commons. In about 1820, Bishop Fisher commissioned Constable to paint Salisbury Cathedral from the grounds of the Bishop’s Palace, and Constable started to prepare sketches and studies for that medium-sized painting, which was completed in 1823. He also painted some near-copies. The trees are shown here in rich and almost botanical detail, complete with lichens and textured bark, in anatomical perfection. 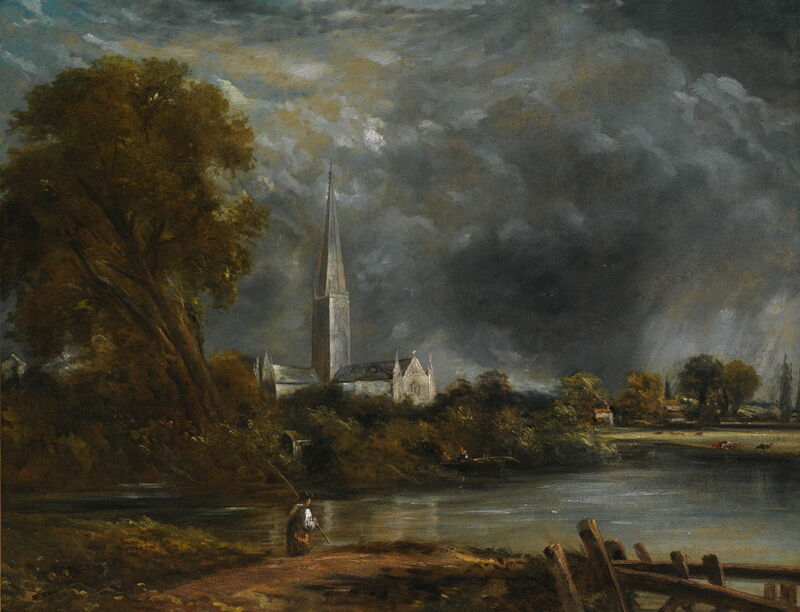 In 1829, when Constable was still battling with depression after the death of his wife, Archdeacon Fisher encouraged him to paint a larger and more ambitious view of the Cathedral from the nearby meadows on the banks of the River Nadder. He started preparatory work then, completing the finished painting for exhibition in the Royal Academy in 1831. 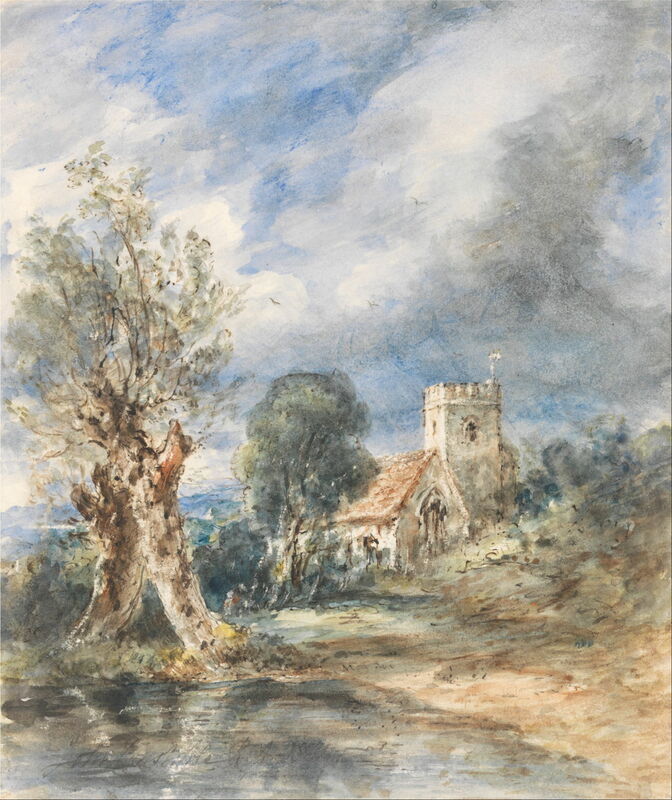 Despite several showings, it remained unsold when Constable died. This half-size and well-developed study for the finished work gives a good idea of how Constable developed from sketches towards completion. The large group of trees shown at the left is quite natural in appearance, and not fully-detailed. 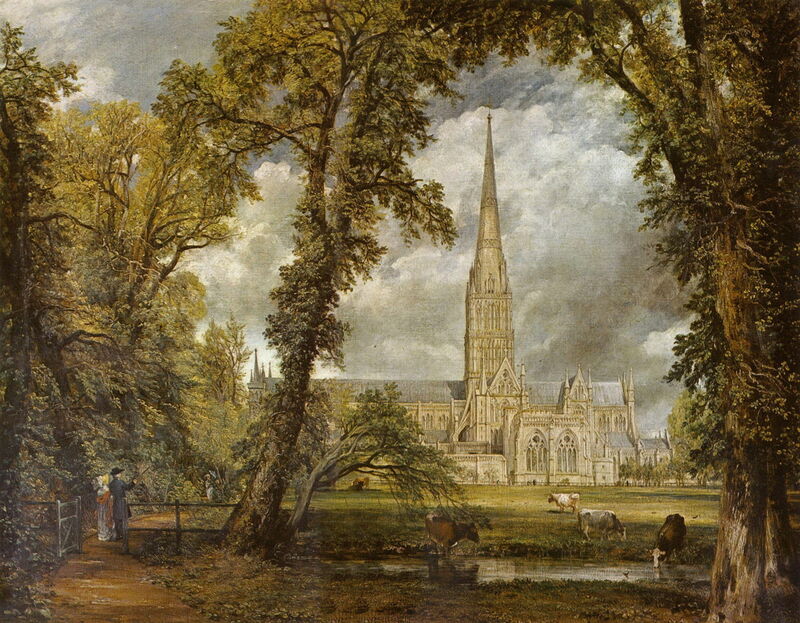 John Constable (1776–1837), Salisbury Cathedral from the Meadows (1831), oil on canvas, 151.8 × 189.9 cm, The Tate Gallery, London. Wikimedia Commons. In the finished painting, the trees have lost their natural appearance and become more gnarled and twisted, afflicted by the same ‘romantic’ tendency that brought the rainbow (whose end is over Archdeacon Fisher’s house) and the bolt of lightning. Throughout Constable’s career, he placed great importance on the depiction of trees, and brought them to the fore in many of his paintings. His earlier finished works showed them in their natural splendor, but later they tended to become affected by a ‘romantic’ tendency, and over-wrought. However, it was his loose and painterly sketches which form the strongest links with paintings of the latter half of the nineteenth century: in those he could easily be mistaken for a member of the Barbizon School, or even an Impressionist. His place as a bridge between the old and the modern is clear, and he remains one of the greatest exponents at painting trees. Clarkson J (2010) Constable, Phaidon Press. ISBN 978 0 7148 4295 0. 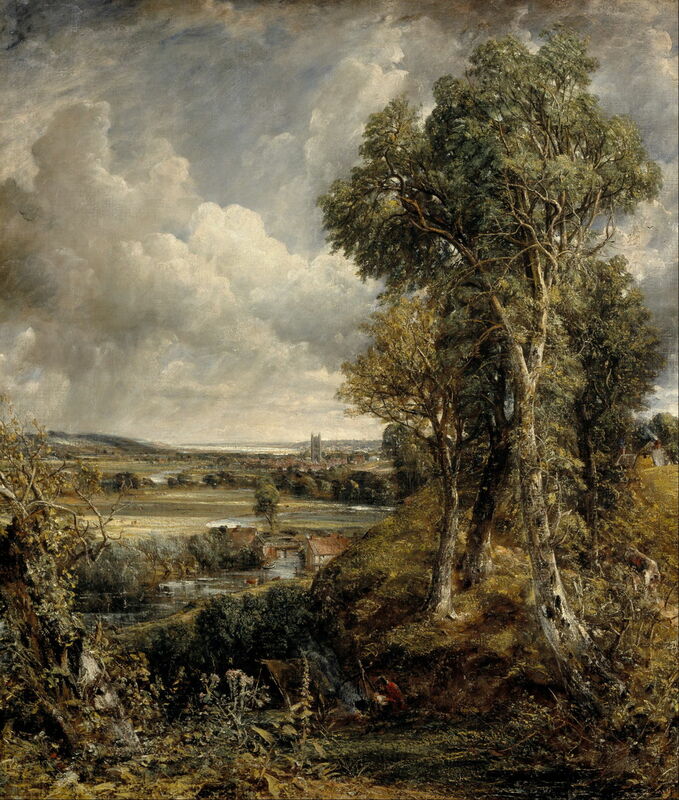 Lambert R (2005) John Constable and the Theory of Landscape Painting, Cambridge UP. ISBN 978 0 521 82738 6. Rosenthal M (1987) Constable, Thames & Hudson World of Art. ISBN 978 0 500 20211 1. Posted in General, Painting and tagged Constable, Corot, Gainsborough, landscape, painting, plein air, Salisbury, Suffolk, trees. Bookmark the permalink. My sincere apologies: I have only just spotted that the autocorrection in the preview text had changed ‘Barbizon’ into ‘Barbican’. I have now corrected that, and hopefully you are less puzzled as a result.